Games4King - G4K Yellow Owl Rescue is another point and click escape game developed by Games 4 King. There were some strange houses in a beautiful and magnificent village. The place was beautiful to see. In that beautiful magnificent village, a yellow owl lived. The yellow owl has been locked in a house there for a day. It is your duty to save the yellow owl from there. 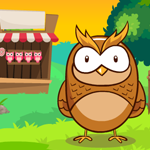 Find all the clues and get that yellow owl from there and wish you success in the game. This game is highly desirable. Play this game will be fun. Good luck. Sliders were easy for a change. Thanks for the game, G4K. Can't get game to load ;( walk through video opens just fine, go figure.